Mine had to go under for an extraction when she was 11. She did fine. She broke a tooth and there were shards. Her teeth are MUCH more brittle than they used to be. I have to be very careful that she does not chew the younger dog's chews. She gets a senior kong every day with part of her meal because she still enjoys chewing she just can't chew hard things. She has broken and had removed two of her little front teeth (each one to the inside of her canines. She doesn't seem to miss those. If the blood was coming from the actual tooth and not just form irritated gums, then there is most likely pulp exposure. The break can be a direct route for bacteria to enter and cause infection. When my girl broke her canine the pulp was visible due to significant damage and the vet put her on abx until we could get her into the dentist. While she was under anesthesia the dentist called to asked permission to pull an incisor that was damaged from some unknown previous event. The X-ray showed a “halo” around the root location which was sign of an infection. Poor girl we had no idea. Good luck, hope all goes well. I will look into that, thanks for the article as well. To be honest I was a little shocked about how cheap this procedure is. Has me wondering what the quality is. It was $195 for the exam and blood work yesterday. The anesthesia is $100 and the dental cleaning is $100. If extraction is needed, it is $11 per tooth. Look for a "Board Certified" in your area. Mine was around $978.00 NOT including pre-surgery blood work!!! That is unusually low. I was quoted a much higher amount for a cleaning, and even more if extractions are needed. That is close to what I was given as an estimate. Her teeth need cleaning but don’t look like extractions are necessary. I put it off due to other ongoing health problems. All our senior dogs have been put under anesthesia for different things, dentals, xrays, etc., the oldest being 12. All did fine. One of my gsd, Cody, did seem like it effected him more. He would come home and sleep VERY heavily, like his eyes almost seemed to sink back, kinda freaked me out, he would be fine the next day. I had never heard of MDR1 then, but now after I had learned about it, it does effect 10 percent of German shepherds. Now I wonder if that's why he'd sleep so heavily after a procedure. Maybe not, he was never tested for the gene. My other dogs, Clipper the gsd and Moo, non gsd, never slept like that afterward. I had read about MDR1 researching collies. Last edited by readaboutdogs; 02-01-2019 at 08:29 PM. Blood results came out fine, almost perfect the Dr. said. The certified dentist closest to me doesn't have very good reviews. Going to have a full set of x-rays done. Everything is scheduled for next week. 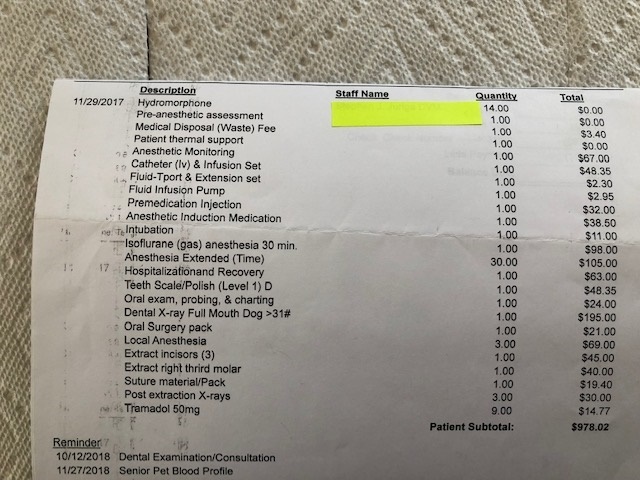 Yeah the pricing does seem low, although my dog's last anesthesia was an emergency surgery for a ripped ear (had to stitch it back together) and it was only about $500 bucks. It's probably good that you are proceeding with the dental care. Unfortunately I didn't notice my prior dog, Becca, had a damaged tooth until she had some facial swelling. At that point, she had an infection and other teeth were involved. She ended up seeing a doggie dentist, had to have several teeth extracted, with a bill of around $3,500. I was surprised that Becca didn't appear to show signs of a problem, prior to the swelling. Her appetite was fine. I'm thinking I'll likely do some proactive dental care with my puppy, Cassie. I know with even the best efforts, dogs can end up with damaged teeth. Hopefully with periodic exams and cleaning, I can prevent a situation that affects several teeth. It seems like it really starts to matter around age 3. By that age, 80% of dogs have gum disease starting. That's when they start accumulating lots of tartar, if they're fed kibble. We actually were taught to use the tartar build-up on the back molars as one of the markers to "age" dogs that "look" young in rescue--if it's there, the rule of thumb is they're at least 3. Since my dogs are chewers, and based on how they present, my vet has approved my dogs being in an "every few years" rotation--he checks the teeth during their annual exam, and when they're showing build up, we schedule the dental. Sometimes that means every other year, sometimes every 3, but we base it on the individual dog. Last edited by Magwart; 02-02-2019 at 11:13 AM. If you brush your dogs teeth they do remarkably better. I have a 12 year old dog who had her teeth cleaned as a courtesy during that extraction at age 11. They really had no tartar buildup at all, and that was her first and only cleaning in her life. Every vet she has ever been to remarked about how clean her teeth are. Now my boy is 3 1/2 and he does have some small stains in one side but it is nothing like the buildup I see on my boarder dog's teeth and my dogs don't have bad breath. We brush with CET. My old yellow dog adopted at age 3 and started brushing, he never had to have a cleaning and he passed at age 10 from cancer with pretty clean teeth, healthy gums, and nice breath. Last edited by Thecowboysgirl; 02-02-2019 at 01:41 PM.